Following a quick trip to the Middle East, Kerry will visit the two Southeast Asian countries through next week. U.S. Secretary of State John Kerry will travel to Vietnam and the Philippines later this week, the U.S. State Department announced on Monday. According to a statement released on Monday, Kerry will be traveling abroad from Tuesday through the middle of next week. After a stop in the Middle East to meet with Israeli and Palestinian leaders, Kerry will travel to Southeast Asia to visit Vietnam and the Philippines. “Within the Asia-Pacific rebalance, Southeast Asia holds special importance, and the Secretary’s travel to Vietnam and the Philippines demonstrates the enduring U.S. commitment and his personal connections to the region,” the statement said. While in Vietnam, Kerry will visit Ho Chi Minh City, the Mekong Delta region, and Hanoi. Kerry will focus on a different issue during each stop in Vietnam. In Ho Chi Minh City, for example, Kerry will focus on expanding bilateral trade and cooperation in education. In the Mekong Delta, Kerry will emphasize the potential for U.S.-Vietnamese cooperation in areas like climate change and renewable energy. Under Kerry’s predecessor, Hillary Rodham Clinton, the U.S. started the Lower Mekong Initiative (LMI), a multilateral project that aims to foster cooperation and greater integration among Vietnam and its neighbors in areas like education, health, environment and connectivity. Besides Vietnam, Thailand, Cambodia, Burma and Laos are also participating in the LMI. While in Hanoi, Kerry will meet with Vietnamese leaders to discuss how to best advance the comprehensive strategic partnership the U.S. and Vietnam signed during Vietnamese President Trương Tấn Sang’s trip to Washington, D.C. back in July. During that visit, Kerry hosted the Vietnamese leader for a working lunch. The statement released on Monday indicated that the bulk of Kerry’s time in the country will be spent in Manila discussing “economic, security, and people-to-people relations” with Philippine officials. The statement also said that Kerry plans to visit the city of Tacloban, which was one of the areas that was most badly hit by Typhoon Haiyan last month. This trip will be the fourth time Kerry visited the Asia-Pacific since becoming secretary of state earlier this year. It comes at a time when the Obama administration is using senior level trips to counter the perception that Washington is not fully committed to the rebalance to Asia amid growing problems at home and in the Middle East. Since Kerry’s last visit to Asia in October, both Treasury Secretary Jack Lew and Vice President Joseph Biden have traveled to different parts of the region. Defense Secretary Chuck Hagel, who is currently in South Asia, is also expected to make a trip to East Asia before the end of the year. President Barack Obama will also be traveling to the region in April of next year to make up for having had to cancel his October trip to Southeast Asia because of the U.S. government shutdown. 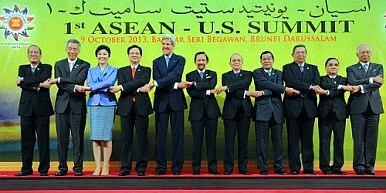 Kerry’s choice of countries to visit during the upcoming Southeast Asia trip is likely to irk policymakers in Beijing. Vietnam and the Philippines are the countries that have the most acrimonious disputes with China over the South China Sea. These disputes have created an opportunity for the U.S. to forge deeper relations with both countries despite continued wariness about the U.S. among some circles in Hanoi and Manila.